These days with heating costs continuously on the rise we’re setting our thermostats lower in order to cut heating costs. Oh sure wearing an extra sweater is good but when you need a little extra warmth an you’re in a relatively small room then this actually works! In the loaf pan place four tea light candles and light them. 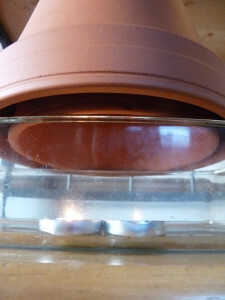 Position the smaller clay pot over the pan and then place the larger clay pot over the smaller one. 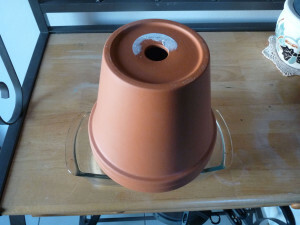 The gap between the two pots enables a flow of air that then passes warm air around the room. Light candles in a loaf dish. Place small clay pot over the candles. 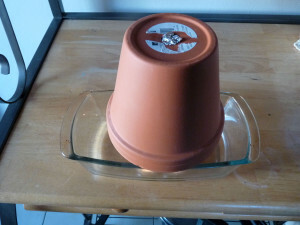 Place large clay pot over the smaller one.